Slayer's best album in 16 years is also their most thought-provoking work to date. Religion and warfare have always been among the many lyrical themes Slayer has explored over the last quarter century, but during their legendary run from 1983 to 1990, the songs were not so much confrontational as merely vivid, horror movie-style scenarios. The topics certainly were attention-grabbing at the time, offering us graphic descriptions of Nazi war crimes, serial killers, occult imagery, not to mention lots of songs name-dropping the ever-reliable Satan, but aside from such classics as "Chemical Warfare", "Jesus Saves", "Mandatory Suicide", and the rousing anti-Gulf War rant "War Ensemble" from 1990's Seasons in the Abyss, the majority of Slayer's lyrics were intended to shock, not offer any clever social commentary. That all seemed to change in 2001, as the stunning comeback album God Hates us All had the band looking inward more, exorcising their own personal demons, and challenging listeners to actually think about what Slayer was saying. 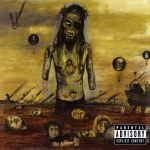 The album's rampant anti-Christian theme was as heavy as the music, with enough lines to stop even the most hardened metal fans in their tracks ("I keep the Bible in a pool of blood / So none of its lies can affect me"). Coupled with the grimly-timed release date of September 11, 2001, Slayer seemed to be an appropriate soundtrack for the world going to hell in a handbasket, and a populace that didn't know what to make of it all. Five years later, things have not improved, with America digging an ever deepening hole in Iraq and Afghanistan, the Middle East bombing the holy hell out of each other, and the distance between the church and state shrinking. On Slayer's long-awaited follow-up, instead of coming off as prophets of doom, they're simply taking scope of what's going on around them, and realizing it's not a pretty sight. Someone or something is to blame, and to Slayer, it's fundamentalism, Christian, Islam, or otherwise. Despite the title Christ Illusion, war in the name of any religious belief is attacked mercilessly throughout the new album, encapsulated perfectly on the bruising opening track "Flesh Storm", as bassist/vocalist Tom Araya bellows, "It's all just psychotic devotion... Here the only law / Is men killing men / For someone else's cause." While it's unlikely the band will ever top such astonishing albums as Reign in Blood, South of Heaven, or Seasons in the Abyss, Christ Illusion is still a remarkable return to form. After a decade where complacency started to creep into Slayer's otherwise aggressive sound, God Hates us All was a musical rebirth of sorts, and the new record builds on that renewed energy, aided tremendously by the presence of original drummer Dave Lombardo, who returns to recording with the band after a 16-year absence. The other primary characteristics of the Slayer sound have always been present (the sharp riffs and dive-bombing, atonal solos of Jeff Hanneman and Kerry King, the demonic enunciation of Araya, and of course, the unrelenting speed), but Lombardo was always the cog that held everything together, and on the band's last four albums, his anchoring presence was definitely missed. Fans will be elated to hear we get a quintessential Lombardo performance; his percussion is powerful, but lithe, it doesn't so much pummel as glide, his maniacal beats sounding effortless, yet brimming with the kind of intensity one would expect from a Slayer disc. The lyrical power and the formidable music makes for an arresting combination, and at a taut 38 minutes, Christ Illusion wisely never overplays its hand, much like the band's 80s output. King and Hanneman have always been the band's main songwriters, but as on God Hates us All, King is at the forefront again, his songs stressing both brute force and the kind of pure, unadulterated speed that has long been the band's calling card. The subtly melodic "Flesh Storm" hearkens back to Slayer's glory days, "Catalyst" continues where the over-the-top rage of 2001's "Payback" left off, while "Skeleton Christ" is dominated by a lurching riff underscored by Lombardo's drum kicks as Araya spews King's blasphemous lyrics with fervor: "I laugh at the abortion known as Christianity / I've seen the ways of God / I'll take the devil any day." Hanneman does contribute three songs, and they rank among the best tracks on the CD. His compositions have always had an epic quality to them, and that continues here: the through-a-soldier's-eyes fantasy "Eyes of the Insane" begins with a descending riff that suddenly changes direction and builds to a towering chorus, while "Black Serenade" contains undulating, ornate guitar flourishes during the verses before exploding at breakneck speed. Hanneman's "Jihad" is one of several standouts, a fascinating departure that starts off with a wonky little riff followed by slower, mid-tempo chords that segue into a stuttering riff that swings, thanks in large part to Lombardo's near-graceful drumming. Depicting a viewpoint from the enemy's eyes always draws criticism in America (just ask Steve Earle), and "Jihad" dares to envision the World Trade Center disaster from the terrorists' point of view. The recited lines, "Strike as champions at the heart of non-believers…God will give victory to his faithful servant," are made all the more chilling by the fact that looking back five years later, those words could very much apply to either the Taliban's attack or the Bush Administration's retaliation. King's "Supremist" is his most adventurous song in years, tossing in tempo changes left and right, highlighted by a rousing breakdown midway through, but it's "Cult" that brings Christ Illusion to its climax. Kings lays all his cards on the table, as he and Hanneman provide a sinewy lead riff before Lombardo catapults the song into high gear, the tempo rapid-fire, the lyrics unflinching ("Religion is hate / Religion is fear / Religion is war"), Hanneman shredding away his finest solos on the record, with the song's bitter sentiment culminating in the couplet, "The war on terror just drags along / My war with God is growing strong." Slayer's music is never for the weak of heart, and is always guaranteed to offend some people, but its harsh criticism of religious extremism (ironically, by one of the most extreme bands on the planet) helps make it the most potent, passionate Slayer album in many years. By voicing such an unflinching opinion, Christ Illusion in turn forces listeners to deal with such blunt sentiment, and make their own choices. Nowhere is that message more apparent than on "Consfearacy": King muses, "I need to redefine / How I see the world today / Seems that all the war / Didn't even up the score," and then shifts the focus on the listener, imploring us to decide for ourselves what is right. "So light the fuse / Impose your views," shouts Araya later in the song. "Complacency is your demise."